Beaded with lovely peach and pink-hued cultured pearls, this Y-necklace from Thailand is designed and crafted with love by Somluck Komolmith. She crafts two butterflies of rhodium plated brass, studded with cubic zirconia. Rhodium plated brass beads alternate with the pearls, and the butterflies form the clasp. 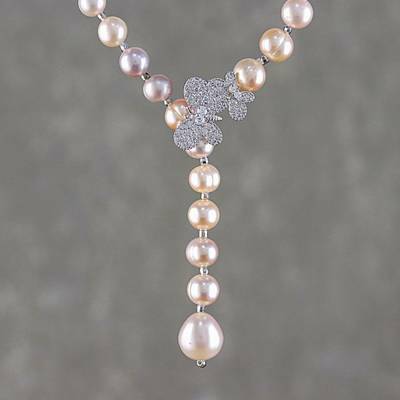 You can find cultured pearl Y-necklace 'Beautiful Butterfly' by Somluck Komolmith in jewelry categories such as Animal Themed Necklaces, Birthstone Necklaces, PEARL Freshwater Necklaces, PEARL Dyed Necklaces, PEARL Cultured Necklaces, Pearl Necklaces, Cubic Zirconia Necklaces, Brass Necklaces, Rhodium Plated Necklaces, Long Necklaces, Beaded Necklaces and Y Necklace Necklaces. Enjoy exploring these sections for other Novica treasures.